I recently came across some of Harry's newborn clothes under his cot whilst having a clear out before Christmas. I have kept a few of his little baby grows as I love smelling them and bringing back memories from when he was teeny tiny. Please tell me I'm not the only one who does that? Whilst putting them back in the drawer I realised that I didn't have that many clothes for his 12-18 month wardrobe. He's still in 9-12 on the bottom however has started to fit in 12-18 months on top as he's filling out more so desperately needed to start buying some clothes in the January sales. At the end of last month George got in touch and asked if we would like to choose some clothes from their wonderful baby clothes section and if I'd also like to choose an outfit from the George clothing range how could we say no? Since having Harry I've become rather fond of the kids clothes at George, they're fantastic quality at a great price too! I don't tend to buy clothes for myself there but once having a browse through the website I found some lovely bits! I chose this outfit for Harry to wear for his birthday last week however the t-shirt and joggers are still too big for him. The hoody is so warm and cosy, which is perfect for this time of year. I love black, grey and white and these socks are a great addition to his wardrobe for pairing up with his outfits. 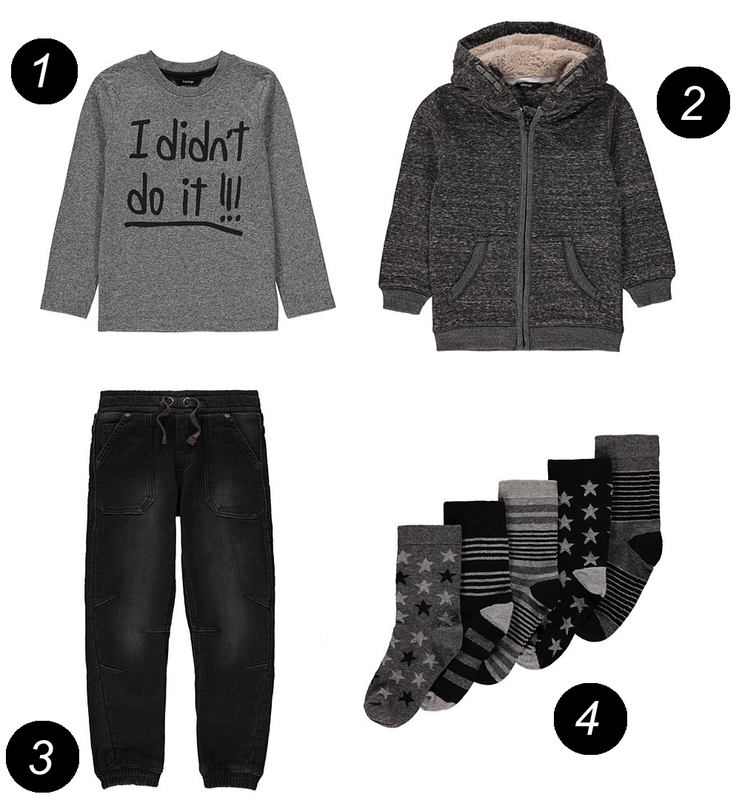 This outfit is perfect for lounging around the house but also casual for going out too. I love the items I chose, you may notice a theme going on. 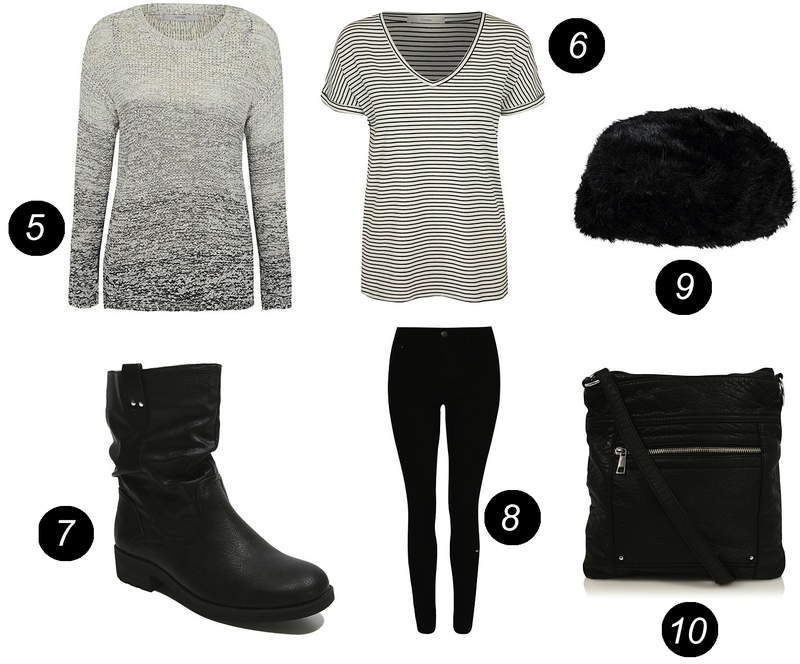 I love wearing black, grey and white even more so in the winter months so these are perfect! 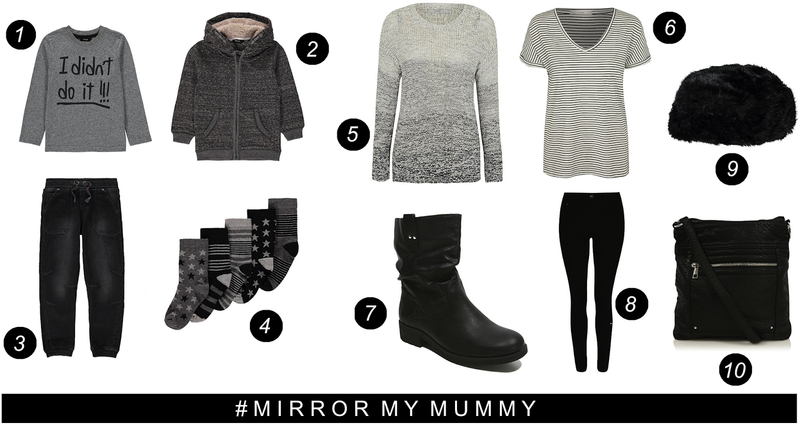 The ombre jumper is gorgeous on and goes so well with black skinny jeans or jeggings, George unfortunately don't have size 6 but I have my own jeggings and have shared a link above so you can get some similar ones. The striped T-shirt also goes well with the jeans and boots and I thought the bag and hat would make great accessories. As I've said previously the clothes at George are all very affordable and of great quality too! I will definitely be browsing the George range for myself in future as I am very impressed with the quality just wish they did my size on the bottom! I can't wait till Harrys outfit fits him and we can get some photos as our outfits are very similar colours. * In collaboration with ASDA. For details on how I work with brands take a look at my work with me page. Aww love asda clothing we have the I didn't do it top for our little boy it's lovely. I have a boy and girl to clothe so it's awesome that George is such great quality and value for money. You could directly install the apk on your device or have to obtain playstoreapp the web content from anywhere he is making use of the device. Install the app on your PC and start using it. There votebyissue camera.You can utilize this application to determine. The alternative is payroll card. Your direct down payment established. ACES ETM Login Where Visa cards are accepted take out cash at the ATM and create pre-checks.